Before the invention of photography, great composers and musicians were immortalized, if at all, on canvas. With the rise of the Romantic movement, they were often depicted in dramatic, larger-than-life or even positively heroic guises. Striking images such as that of Beethoven the wild-haired, granite-like Titan, have indelibly influenced the perceptions of subsequent generations. But what if Ludwig had live just another fifteen years or so? Might not the way that posterity views him have been significantly affected if, instead of those “tortured genius” images in oils, we could actually see photographs of a rather scruffy, seriously balding and depressed old chap, beaten down by years of deafness and personal disappointment? Several of Richard Strauss's best-known scores encourage us, either overtly or subconsciously, to perceive him as a heroic figure (Ein Heldenleben), even when he depicts himself in a simple domestic setting (Sinfonia domestica). But, thanks to the fact that he lived in the era of photography and, subsequently, film, we can see that his actual appearance and lifestyle were much more conventional. That is really only common sense: as the Bavarian State Orchestra's Klaus König observes in this film, "How is somebody who writes such richly-coloured music supposed to look? I certainly don't know. It would be almost carnivalesque." Thus, pace the heroic image implied by his music, it has often been noted that the real-life Strauss resembled nothing as much as a bank manager. In fairness, we might also note that exactly the same observation was made of his contemporary Alexander Glazunov. But the latter was also said to pass muster on his better - less inebriated - days, as a retired colonial tea planter and that, without question, would have been far too exotic a fantasy occupation to ever think of pinning convincingly on the more mousy-looking Strauss. It is that very contrast between, on the one hand, the conventional man with entirely bourgeois aspirations who enjoyed nothing more than taking a gentle stroll with his dog through his carefully tended Bavarian garden and, on the other, the musical "superman" (Also sprach Zarathustra) that makes Richard Strauss an even more interesting subject of study. This new documentary by Eric Schulz is clearly a labour of love for both him and his various expert talking heads. In some ways, though, it is easier to describe what this film is not, rather than what it is. It is not, first of all, a biographical study. While it covers many of the major events of its subject's life, they are not presented within a strictly chronologically framework. Neither is it a detailed examination of Strauss's music and what makes it distinctive, although many of the scores are discussed and illustrated by pianist Stefan Mikisch. Lacking a clearly expressed overall theme, this film emerges instead as something of a plum pudding, filled with fascinating nuggets of information and intriguing themes – several of which might have deserved further exploration in individual studies of their own. I know very well that my symphonic works do not touch the genius of Beethoven, I know the distance that separates my operas from the eternal works of Wagner, but I believe that the variety of their dramatic material and the forms of their treatment means that my operas will, particularly in their relation to all earlier theatrical works, claim an honourable place at the end of the rainbow. As Stefan Mikisch and musicologist Walter Werbeck explain, Strauss himself conceived the chronological course of musical history as a rainbow, first rising up into the heavens and then falling back to earth. At one end, its origins lay in pre-Christian Greek culture. At the other, the rainbow ended, so Strauss came to believe by the 1920s, with himself. That may seem a remarkably egotistical assertion, but it's worth noting that even today Klaus König can assert that "What I profoundly admire about him … is that he formed a conclusion to an entire age. Just like Beethoven had a huge influence on an entire century, Richard Strauss concluded it; he topped it off, just like that." 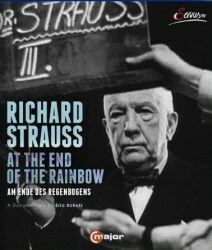 Those who have chosen to position Strauss at that metaphorical rainbow’s end – not only the composer himself and Herr König but others including the late musicologist and polemicist Theodor W. Adorno - do not, however, have it all their own way. Expert contributors to this film such as Raymond Holden, author of Richard Strauss: a musical life, certainly look back to relate Strauss to such varied figures as Mozart, Nietzsche and Goethe: but they also place greater emphasis on Strauss's modern and constantly re-creative side. Often something of a puzzle to his contemporaries, the composer’s many innovations in music entitle him, in the opinion of Walter Werbeck, to be considered "more modern than Schoenberg" and the whole tenor of Eric Schulz's film supports that assessment. Other topics that are covered, often all too briefly, include the influence - both personal and professional - of Pauline, the redoubtable Frau Strauss, and the significance of the composer's songs, many of which were often written for her to perform. Composed from the age of just six until just a few months before his death, they form the most constant element in his output and we see several fascinating clips of the talented Australian soprano Emma Moore being coached in them by no less than Brigitte Fassbaender. Consideration is also given to Richard Strauss's important career as an interpreter of his own and other composers' works. Christian Strauss reckons that his grandfather spent between 6,000 and 6,500 evenings as a jobbing conductor during his long life, entailing an enormous amount of travel both in Europe and North America. Seen on the podium, Strauss appears to do very little. His left hand is almost always firmly at his side, his right hand's movements are relatively modest and his face is so generally blank that Ms Fassbaender becomes quite ecstatic when she momentarily detects what she sees as a glint in his eye. But Strauss’s apparent lack of effort produced, in the judgement of every expert consulted here, incredible results. Raymond Holden is particularly impressed by the fact that filmed and recorded performances show Strauss as "always on the front foot" and headed in a definite interpretative direction: "Masterful conducting ... Masterful!" he exclaims as he watches one particular old piece of film. Klaus König has no doubt either, assessing Strauss the conductor as "one of this century's absolute greats". With such a scatter-gun approach, this film will not be an especially useful introduction to the composer and his music. Viewers who already know some of his music will, however, find it full of fascinating insights, with archive and modern material especially well integrated. Only the use of a pair of young actors in 21st century casual wear to depict the composer and his wife seems a rather unnecessary device. All in all, Richard Strauss: at the end of the rainbow can be regarded as an enjoyable, if arguably somewhat flawed, supplement to last year's Strauss 150th anniversary celebrations.